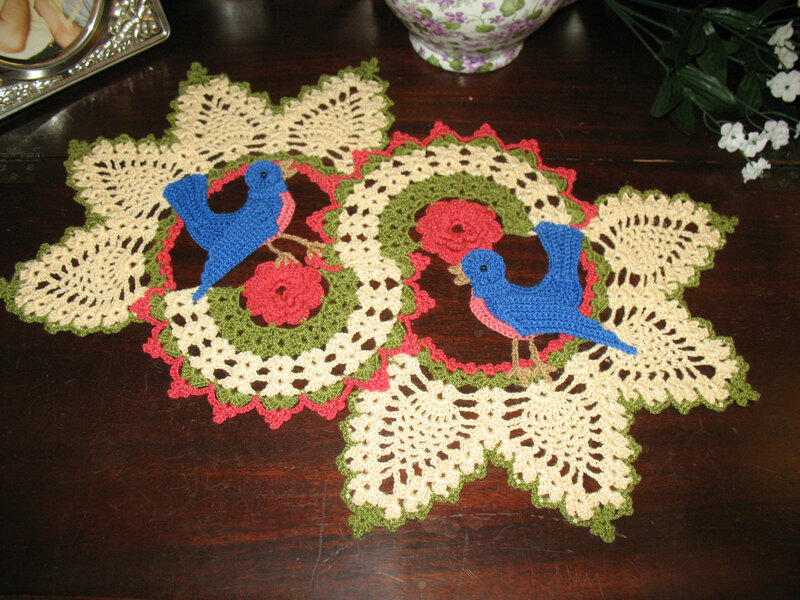 BellaCrochet: Sheryl Hendricks Is "Crazy About Crochet"
A couple of weeks ago, I noticed that I had sold several copies of my Blue Birds Of Happiness doily pattern in one morning. I checked back a little later, and saw that several more copies had been purchased. I was happy to make the sales, but I wondered what was going on. The pattern has been out for a couple of years, and its sales have been kind of flat for a while now. The sales continued to pick up for the next several days, and I also noticed that I had gained several hundred new ‘Likes’ on my Facebook page. 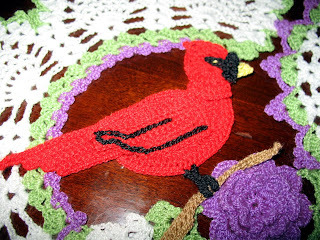 I figured that an online crochet group must have picked the pattern for a crochet-along, but I was wrong. It turns out that I have Sheryl Hendricks to thank for it all. A few days earlier, she had posted a picture of a beautiful doily that she had made from my Blue Birds of Happiness pattern on the ‘Crochet Crowd’ Facebook page, and had kindly directed those who asked about the pattern to my website. Many people found my site for the first time through Sheryl, and I am truly grateful to her! I have always believed that word of mouth is the best advertisement, and this is a perfect example. One of the people who admired the pictures of the Blue Bird doily that Sheryl had made challenged her to make a doily with cardinals, and she quickly worked one up; it is truly amazing! “I learned to crochet when I was about 12 years old. My Mom taught me. I really enjoy being creative with my work. I'm 53, and a retired Registered Nurse. I have 5 children and 3 grandchildren. I had to retire when I ended up with COPD, a lung condition that requires me to use oxygen. About 2 years ago I started making doll clothes and just went crazy. 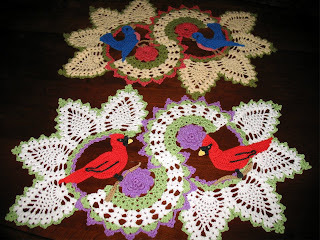 In fact my Crochet page on FB is "Crazy about Crochet." I also have a shop on Etsy called "Mimi's Dolly Things". Most of the doll clothes were designed by me and all of them are ‘one of a kind.’ I rarely follow a pattern through and through. 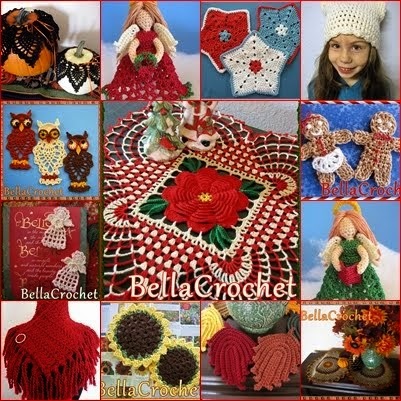 In the past 2 years I have made so many gifts and doll clothes that I can't even remember all of them. I do keep a pretty good picture record, though, so I can look back. I get kind of frustrated some times when I know somebody really wants to make something that I designed but I have no pattern to share. I tried writing a pattern once...actually did write it...but it took away all the fun for me and by the time I was done I was a frustrated mess." 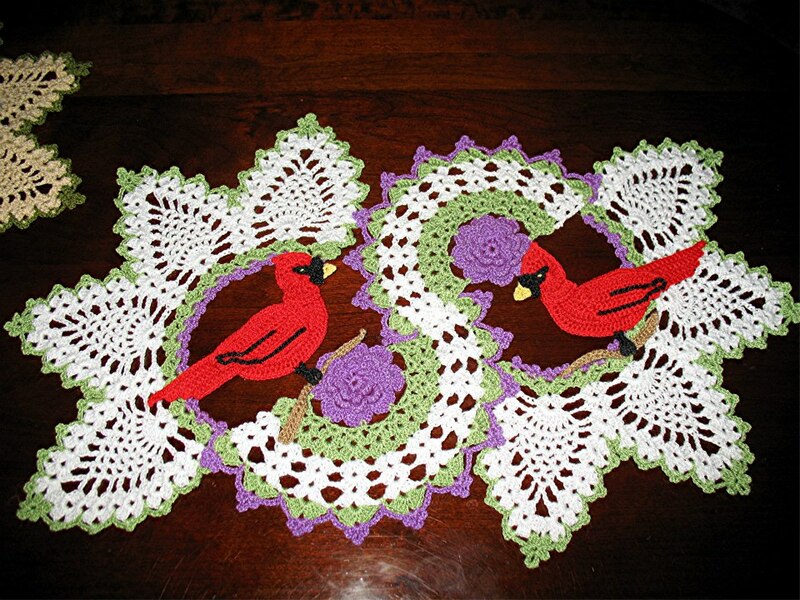 I think Sheryl's eye for color and talent for designing is evident in the beautiful items she crochets. Thank you again, Sheryl, for all of your help! All photos in this post belong to Sheryl Hendricks, and are used with permission. I love seeing this kind of warm, cheerful and kind connection between people. It warms my heart even more to see that at the centre of this connection is crochet, which we all love so dearly. I hope to see more inspiration from the both of you! Yes, I saw the bluebirds on the crochet crowd site. This is a stunning centre piece!